Deciding to own a house is one of the most expensive investments you will ever make. It's also an investment with ongoing expenses. One of the more costly items in your home is likely to be your garage door. A good door will make your life easier but the reality is that large repairs can be costly. Our experts have provided a few tips below to help you avoid unnecessary expensive repairs. If you're interested in avoiding costly door repairs you should deal with problems as soon as you become aware of them. For example, if your door is making a lot of noise or seems to be slower when opening and closing, get it looked at straight away as small problems can become big ones quickly. Regularly checking your door will help you identify any problems before you've got something more stressful on your hands. Preventative maintenance checks each month or so is advisable as is routinely lubricating all of your door's moving parts. These things will ensure smoother operation and will minimize the need for actual repair work later on. We're always on the lookout for the best price and want to help you make your money go that little further. Unfortunately when it comes to garage doors, we really advise against going for the cheapest option. There's no need to go for the most expensive but do a little research and choose the best option for you depending on your budget. The reality with doors at the lower end is that they're likely to require more maintenance and upkeep in the future. Garage systems are not really a safe type of DIY project unless you're trained in dealing with them. There are many things that can go wrong, and one mistaken step can result in expensive damage to your door, or worse, serious injury to yourself. It's better to be safe than sorry and seek the services of qualified professionals. 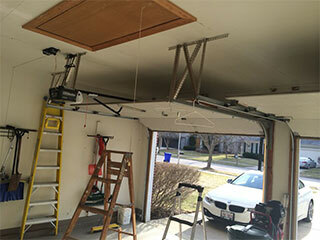 Contact our experts at Garage Door Repair White Plains today!